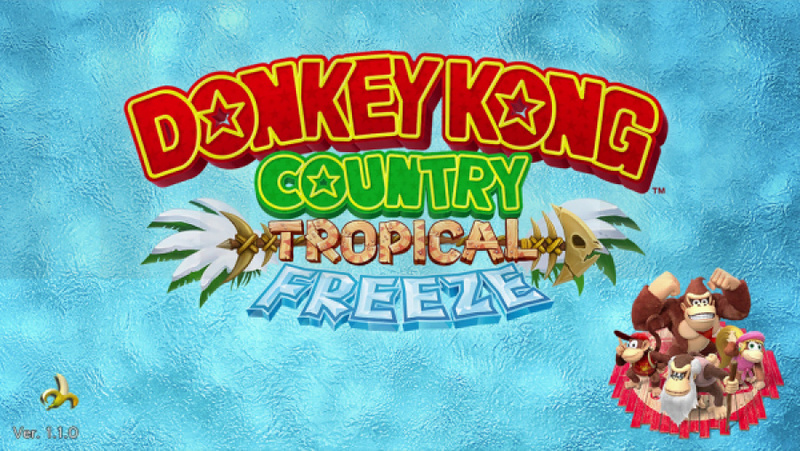 Nintendo has made a software update available for Donkey Kong Country: Tropical Freeze today that fixes a game-halting glitch in World 3. According to update notes, the patch will solve an issue some players have faced when completing level 3-3, Frantic Fields and finding no path has opened to the next level, Scorch 'n' Torch. To initiate download of the update, simply start the game in your Wii U while connected to the Internet. According to the notes, players who have already experienced this problem should be able to continue their game unabated. The new version displayed on the title screen will be 1.1.0, so make sure you have that before heading in. Otherwise, your fields might just end up being more frustrating than frantic. I wonder what caused it to happen in the first place. Well I luckily never encountered this on my playthrough seems rare. Was hoping these as addressing the lag between l loading screens. I've beaten this game about 5 times over and never experienced this. Huh. Didn't know about that kinda problem. I was kinda hoping for loading times being reduced but hey. I 100%ed the game anyway... Glad its fixed regardless. I never experienced this, but I feel for those who did, especially since they didn't get to listen to the eargasm that is the Scorch 'n' Torch soundtrack. I never heard of this glitch. It's nice to see Nintendo/Retro take care of game-breaking issues before they escalate. I too did not have this issue and was hoping it fixed the loading time. Oh well, the loading isn't too bad and it's easy to overlook this problem as it's awesome to play and look at. Any chance of them adding control options for Rambi? Making him run and jump with X/Y + B/A is killing my thumb. I'm about halfway thru level 2-2, trying to cross that dam burning bridge, and I'm about to trade-in the game. I made it past once only to die on those sections that fall. I really miss "super guide", or whatever they called it DKCR. Not very sporting of them taking it out. Anybody know of a spot to stock up on red balloons like that dessert world in Sonic Lost World which let you get 100 lives in about a minute? There's really no point in my retrying the level w/ only 4 balloons. I had 14 when I started so things were going well for a little while. Last question - whats better - Quit or Continue on the Game Over screen? Glad I never had this problem or I'd have been waiting a long time to finally progress some more. Are you using the banana coins? Whenever I am low on lives I just use my hoard of coins to buy more balloons. I lost tons of lives on Bopopolis, but it never felt as much as they give you a lot of coins, so you can buy lives from Funky. @rjejr Here's what I do: grab every banana you see. They not only give you extra lives, but also often reveal hidden puzzle pieces. Even in hidden temple stages, where I lose a LOT of lives, my total rarely goes down too much because of how many extra lives I make during them. Speaking of bananas, they also let you use the Kong Pow moves, and you can get loads of extra lives by kong-powing with Diddy (it will turn all enemies into red balloons). Other than that, what @sinalefa said. Banana coins are pretty common, and they can buy extra lives if you're low. About the super guide, I'm actually glad they got rid of it. It was just a super cheap way to get past a stage while negating the challenge DKC games are known for. I'm pretty sure I'd be way less invested in the series right now if they had such a feature back in the SNES... the feeling of accomplishment after completing a particularly devious stage is just so great. I was hoping the patch would be to put Stickerbush Symphony in the Bramble Blast stage. @ricklongo If something optional like the Superguide is the deciding factor of whether or not you're going to enjoy a game, then your opinion is questionable. It's nice to have that kind of thing around for people that didn't grow up with platformers like us, or just never got good at it. Mainly because it doesn't skip the entire level, it shows a CPU walking through it, in case somebody is genuinely stuck and needs a reference point. Also, it doesn't mark the level as finished when you use it, so there's that. @sinalefa - Havent used them yet, got about 150 so might as well. As much as that stupid rhino is killing me - wasn't much better w/o him though - not sure its going to help. And my thumb really needed a break, it's never been the samesince broke it. @ricklongo - "the feeling of accomplishment after completing a particularly devious stage is just so great." My kids on the principals list (avg. above 95) in middle school, that's my accomplishment, I only play games for fun And when they aren't fun I like "skipping" to the next level. Paying $32 for a game to play 6 levels then getting stuck isn't fun, or fair. When YOU finish all the levels then want to go back and get all the puzzle pieces and KONG letters do you play thru every level from the beginning or skip to the level you want to play again? @JaxonH - "Huh, guess the guy really WAS stuck from progressing.."
@rjejr My opinion on Super Guide is I'm fine with it existing as long as it's always possible to avoid. There were locations on Sonic Lost World for example when that wasn't the case and it became really annoying (Desert Ruins Zone 1 and Sky Road Zone 4 come to mind). @PrincessEevee9 The reason that best explains why there is lag in the loading screens, but the frame rate elsewhere is a solid 60fps is for one reason. I may be wrong with this comparison, but think about when curtains are closed on stage, and props are getting set up. The same thing is happening with DKC:TF, the loading screens are essentially 'loading'/setting up the stage and everything in it, so all lag that occurs happens in the loading, and not the stage itself. @CrabGats - I think in DKCR I actually did use the super guide to skip entire levels, mostly the minecart levels, I just really cant stand those. @Grumblevolcano - "as long as it's always possible to avoid." As much as I used them, I agree, I dont want to use them if I dont want to. There were a few times were I was really bent on beating a level only to jump into a feather by accident and go "oh dam it". They were really poorly located sometimes. Better to have them than not b/c you could always just start the level over, but yeah they were poorly placed at times. That is what I like from games like Rayman or Yumi's Odd Odyssey: they are challenging but the lives are infinite. I hate when my life tally just keeps going down, and that is why I haven't beaten Champion Road in 3D World. At times like these I feel like lives are obsolete, as you will keep trying anyway, but they do add extra stress as you mention. @sinalefa - "I haven't beaten Champion Road in 3D World." When I trade-in DKCF I'll go back and finish SM3DW, a least it won't have minecarts Unless it's hard, then I'm playing Xenobade full time, I heard its long and I'm only 2 hours in. And I just got Batman Arkham City yesterday, games are always in supply w/ PS+. Would like to get thru DK though. @sinalefa Without lives there is no incentive to try and play well. You can progress by getting lucky once instead of having to perfect a reasonable amount of the game before going on. Having to do a reasonable chunk with a limited number of lives removes that. Playing well should be something I want to do, not something a developer forces upon me with an arbitrary amount of lives, time, etc. The level won't complete itself, so you still need skill to beat it. You won't get lucky in every single level. Even though games can't really be Bug or Glitch free. I'm glad games can be patched nowadays. Ah. Thought the loading times was gonna be fixed. One of my jerky friends is always saying the WiiU can't run DK game well because of all the freezing during the loading screen. I beat the game and never knew this was an issue. Well, that's good that they fixed it. Was this maybe a EU version only bug? @XFsWorld - I found that to be a weird complain, it's a loading screen...it's there so you aren't staring at nothing for ten seconds between areas. It has no bearing on the actual gameplay...and the actual gameplay is silky smooth and runs beautifully. Yeah i didn't encounter this on my play through either lucky me i guess. @Action51 Yea that loading screen in between levels and that cloud loading screen seem to pause and take awhile to load every single time. I dont remember once it went faster than usual. I beat world 3 and i never faced this glitch wierd. @Marioman64 Longer than Sonic '06 loading times? Ouch, painful. Loading times are about right on par with the loading times from DKC Returns. It's about 7-9 seconds on average while each stage loads. I timed loading stages from each game after reading a complaint on Miiverse. This is what the microwave has done to society. It's a matter of seconds- people have just grown more impatient since Returns released. Lego City Undercover, now THAT has long loading screens. In fact, Splinter Cell Blacklist- THAT had long loading screens. I can think of dozens of games with much longer load times, like 2, 3, 4 times as long as DKC Tropical Freeze. Granted, the loads are slightly on the "longer than average" side of the scale, but not by much. The worst is the menu screen loading, which can take up to 20 seconds (but sometimes only half that). But considering the game is over 12GB and all data is read completely from disc (no installs), it's understandable. I mean, game loading isn't magic. The data must be read, and that takes time. Didn't know about this. I've already beaten the game. Must not be every game! To everybody complaining about loading times, try playing Mod Nation Racers on PS3 I think it took over 5 minutes from the time you put in the disc until the time you could actually start a race. Now it was more than 1 loading screen, maybe 5, but that's still 5 one minute long loading screens while you wait to race. It was unbearable, but at least I finished the game, as hard as story mode was. That said, games going back tomorrow. Took another stab at Zip Line 1-B and that was fun and relatively easy, racked up a few more red balloons and finally went to visit Funky. Bought some greens and a heart+ to take into 2-2. Got Daisy out of her barrel and got a couple of Kung Pows so we were looking at 4 gold hearts and a couple of green balloons, sitting pretty. Then the burning bridge. Daisys gone and she never comes back, no barrel there. Green balloons don't help when the bridge collapses out from under you. Red balloons run out, Game Over. Blasted through and never encountered that thankfully. Mine wont update, didn't show up on Download Management screen and it lauches the game without updating. Theres no update file for it in the system memory and the start screen isn't displaying "Ver 1.1" ... maybe its a regional patch. @rjejr Don't worry, I read your reply more as a tongue-in-cheek answer than an actual jerky remark. The points you make are fair, but I guess it just comes down to the series not being necessarily for you. As a kid, I got obsessed with the SNES original games, and every life lost was only fuel to my I-gotta-finish-this-game fire. As such, the super guide was a big pet peeve of mine; one which prevented kids these days to experience the same feelings I did back then. 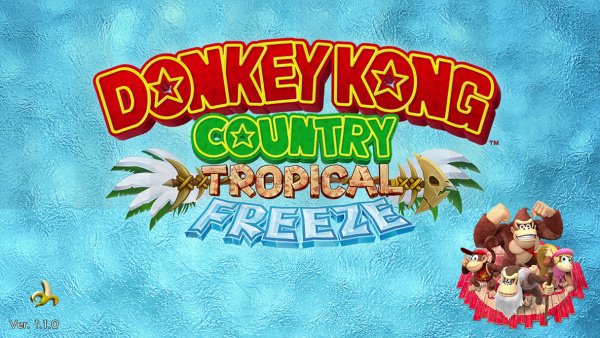 I didn't mind all the trial and error because the game's atmosphere, graphics and music were so jaw-dropping, and I believe the same is true of Tropical Freeze. It's like how I don't even bother complaining about first-person shooters anymore - I know they're just not the kind of experience I crave. @CrabGats "If something optional like the Superguide is the deciding factor of whether or not you're going to enjoy a game, then your opinion is questionable"
Agreed! I'd be feeling really bad if I had said that at any time. 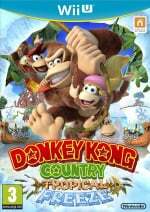 @ricklongo - "I didn't mind all the trial and error because the game's atmosphere, graphics and music were so jaw-dropping,"
Yeah, that's how I feel about DKCTF, until I don't In my defense, they already had this in the 1st game, and then they took it out, which adds to the frustration level of "why can't I just skip this, I skipped it last game." But you're right, it's not for me, which is really annoying b/c I want to play it, I'm just so sick of being stuck at that spot. And since I know from your comments you're a gamer, this thought bothers me as well - people are always complaining about causal games, "free-to-pay "or "free-to-start" whatever Iwata said. Games like Candy Crush where you have to pay to get to the next level. People are always bashing those. Well at least those games are honest about it. I paid (rounding) $50 for 50 levels of DKCTF, but I can only play 5 b/c now I'm stuck. Why cant I just play whatever level I want, I already paid for all 50 levels, why cant I play them? Maybe if I skipped ahead and played some of the harder levels in world 4 or 5 I could get better and then come back and laugh at level 2-2. But I can't. I'ld rather pay $1 per level and just be out the $5, at least thats honest and it would be worth it, those levels are really fun. Arcades are dead, nobody who pays $50 for a game should be kept from playing it. And people who complain about pay-to-play really can't see the downside to the other side that people paying full price have to endure. Huh... I was lucky then, because I didn't encounter that. At least it's fixed, and nowhere near as disastrous as the Castle Crush glitch. @XFsWorld oh yeah, I got that it was your friend complaining and you were just describing them. I've heard other people on message boards make the same complaint. I'm still wondering if this was an EU only issue with the glitch.